I just tried yoga again yesterday and Iâ€™m taking 5 classes FOR FREE!!! Urban Ashram Manila celebrates their newest location at the Bonifacio High Street. It is very accessible to where I work so itâ€™s perfect! With their soft opening, they also invite and encourage yoga enthusiasts and those who want to try it by joining their Open House from July 14 â€“ 24, 2012. 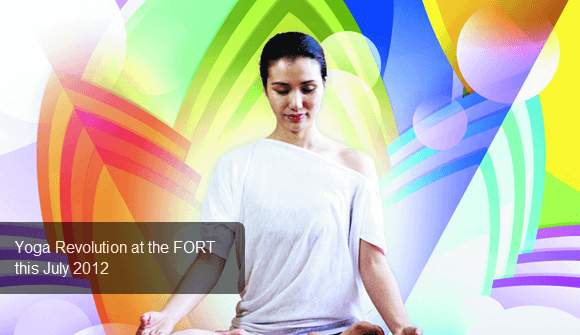 Over 40 FREE Yoga Classes for you to sign up for from 14 to 24 July 2012. PRE-REGISTRATION REQUIRED TO JOIN ANY OF THE OPEN HOUSES CLASSES. You can sign-up for to a maximum of five (5) classes during the Open House period. Regular class schedules will follow starting July 25 and you can check out the class schedules for the rest of July and August by clicking here. I took the 6:30am class yesterday and the class said â€œFNRâ€ or Flexibility Not Required. But we worked most of our core out and right now, my abdomen is in blissful pain. The pain you should be proud of because you know your yoga session worked well to tone your body. *Come at least 20 minutes before class time and bring a valid photo ID along with towel and water bottle for the class. No cellphones, bags or personal belongings will be allowed inside the studios. Lockers will be provided on a first-come, first-served basis. Shower facilities MAY NOT be available during the Open House period (because they are still fixing some facilities). I give much importance to doing my workouts the right way. I appreciate my pole teachers, Polecats Manila, on how they value proper form and body alignment. Doing things the right way not only avoids causing injuries to your joints and muscles, but most importantly, your work-out would be more efficient and effective. Urban Ashram as the same value. Although I think the class I took was for beginners, I felt my core like no other! Their technique is not to get overwhelmed with poses but to make sure your body is aligned the right way when you are doing poses. It was a great challenge for me, but I think it would help me much with my pole dancing. Too bad the location is not accessible for me. I heard Ashram is good. A friend of mine attends the same yoga center.